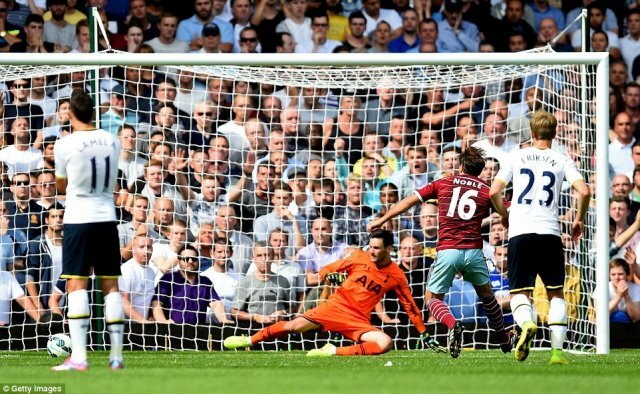 Debutant Eric Dier scored a dramatic injury-time winner to get Mauricio Pochettino's era at Tottenham off to a winning start against London rivals West Ham. Both sides finished with 10 men but it was Spurs who came out on top as new defensive recruit Dier popped up on the edge of the Hammers' box in injury time to round Adrian and slip home a winning goal. The visitors should have been behind at that stage but Mark Noble missed a first-half penalty for West Ham, with full-back Kyle Naughton sent off after handling in the box. James Collins went the same way as Naughton in the second half as he picked up a second booking - with Tottenham only coming to life when the teams were level at 10-a-side. Sam Allardyce had the jinx over Spurs last season as he guided the Hammers to three wins against their London rivals - and the 59-year-old will be left bemoaning his side's inability to hit the target despite enjoying periods of sustained possession earlier in the game. Hugo Lloris made a superb save from Stewart Downing in the closing stages as both sides appeared destined to share the spoils before Dier, playing at right-back following Naughton's dismissal, stayed onside and latched onto Harry Kane's through ball to steer home a winner and give Pochettino a victorious start. During the summer Allardyce had been tasked with bringing a more entertaining brand of football to Upton Park and, up against Pochettino's supposedly free-flowing Spurs side, his team started the brighter. Midway through the half Ricardo Vaz Te miscued when a Collins flick-on found the Portuguese winger in plenty of space at the back post and shortly afterwards debutant Cheikhou Kouyate's diving header flew inches wide of Lloris' goal. With just under half an hour on the clock the hosts were given the perfect opportunity to open the scoring when they were awarded a penalty for handball against Naughton. The full-back was arguably unlucky to be sent off for the misdemeanour but Noble could only drag the resulting spot-kick wide, with Lloris diving the wrong way. The Hammers remained the dominant force for the remainder of the half but could not find a way past Lloris, with Vaz Te flashing an effort wide as Allardyce's side continued to struggle in their quest to find the target. Tottenham came close to breaking the deadlock against the run of play as Lamela stole the ball off Noble and played in Aaron Lennon, who could only whip his shot over the bar. Vaz Te finally forced Lloris into a save, albeit a routine one, as he headed into the ground and straight into the hands of the France goalkeeper. After the break it was Downing who stung the palms of Lloris, with Pochettino deciding to change things on the hour-mark as Andros Townsend and Lewis Holtby were introduced moments before the contest was evened up. Collins picked up his second yellow card as he stopped Emmanuel Adebayor in his tracks with referee Chris Foy having a busy first day of the new season. Christian Eriksen may have fluffed his lines from the free-kick that followed but Spurs were soon in the ascendancy for the first time in the game. Townsend forced Adrian into the best save of the match before seeing a similar effort deflected off target shortly afterwards. With both sides a body light, the game opened up as the half wore on - with Noble only able to shoot straight at Lloris after Younes Kaboul had failed to bring the ball out of defence for the visitors. Allardyce brought on summer signing Enner Valencia for a 10-minute cameo with the Ecuador striker receiving a rapturous reception from the home fans. It was Downing, though, who came close to winning it late on for West Ham. The England winger exchanged neat passes with Kevin Nolan on the edge of the Spurs box before forcing his way through on goal, with Lloris doing well to close in and block Downing's shot. Adrian had to be lively at the opposing end to push out a long-range Nabil Bentaleb drive but the Spaniard could do nothing as Dier, a summer signing from Sporting Lisbon, kept his cool to send the travelling Spurs fans into delirium.